Дата выпуска: 27 января 2017г. Тип выпуска: лимитированный, CWC Exclusive. Волосы: глубокий розово-лиловый (новый цвет), в оригинале "Deep Mauve (brownish dark purple)". Чипы: пурпурные (прямо/special ), светло-голубые (прямо/special), серые (вправо/special), светло-зеленые (влево/special). Макияж: светло-коричневые и розово-оранжевые тени, светло-коричневые веки (special), лососево-розовый цвет румян и бежево-розовый цвет губ . Особенности: ресницы особого черного цвета, веки особого светло-коричневого цвета, серьги, лак на ногтях светло-пурпурного цвета. Колечко: в форме диска, черного цвета, с одной стороны эмблема Anna Sui, с другой - надпись Blythe в бабочке. Аутфит: платье, берет, очки, колготы, сумочка, сапоги, серьги, нижнее белье. Blythe Adores Anna Sui!!! CWC Exclusive Neo Blythe “Blythe Adores Anna” final specs! When I wear Anna Sui, it inspires me to travel the world! Everywhere I go, people turn to look! I adore Anna for creating such dazzling styles that fills my heart! "Blythe Adores Anna" is a re-creation of selections from some of Anna Sui’s most iconic collections. From the accessories to the hair and make up, thanks to Anna's collaboration, this Blythe is very special. The one piece dress has a box pleated skirt with creamy lace and colorful flower prints. There are beads and buttons on the bodice with hand stitched geometric patterns. Her beret is deep purple fur with a cute rose button as an accent. The sunglasses have black frames with off white arms and purple lenses. Each side is decorated with the Anna Sui logo and a butterfly. The butterfly motif is also used in the hook ear rings, which are also decorated with purple beads that compliment the silver of the butterfly. Her black shoulder bag’s strap is long enough to cross the torso, and is perfect for putting small items in. She also wears purple tights, and a pair of beige and black lace up long boots. Her face type is Radiance+, and her face color is fair (natural). Her bangs are cut straight above her eyes, and her long hair is styled in a gentle perm. Her hair color is a specially created deep mauve color! Her eye colors are light blue, gray, purple, and light green, all special colors. Her eye shadow is a light brown above her eye hole, and a pinkish orange on the edges, giving her a lovable look. Her eye lids are light brown, and her eye lashes are special and glamorous black. Her cheeks are salmon pink, and her lips are a pinkish beige. The pull ring for this iconic Blythe is unique. 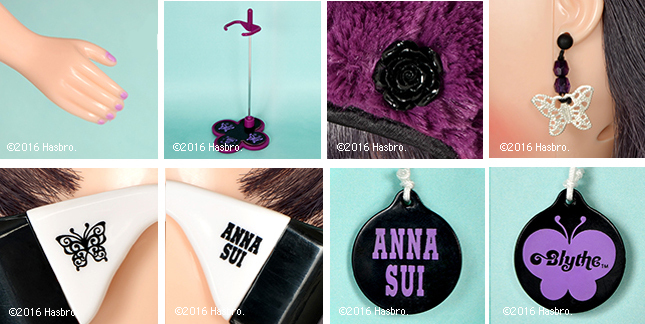 A black and purple Anna Sui logo and butterfly with the Blythe logo within is printed on the pull ring. The doll stand is purple, and the post is silver.